Hey Seattlites! If you have been dying to contribute to REDEFINE, now’s your chance. Starting this weekend, you will find pieces of paper on posts throughout Seattle. These pieces of paper have an empty outline of a square on them, come with an attached pencil, and are rain-proofed by packing tape. Your mission, should you choose to accept it, is to add any ONE contribution to the drawing. It can be of ANYTHING. Just play nice. More locations to be updated tomorrow. Enjoy! Seattle Art Museum’s 75th Anniversary at the Olympic Sculpture Park. Apparently we cannot get enough of the Olympic Sculpture Park, so here are some more fixin’s from SAM’s 75th Anniversary Event on fateful Friday evening. Ah, thank God for comped press tickets. Many a poor chap were watching down into the Bill & Melinda Gates Amphitheater from the corner of Broad and Western, while we were inside, enjoying free (and somewhat delicious) snacks and the perks of an open bar. We were also pretending to be important alongside the folks who had paid a good $175 or $250 for their tickets. Not that we couldn’t have just waltzed in… because we could have. They barely checked. Essentially — if you acted like you were important and knew what you were doing — you were pretty much in. Hehe. Ice sculpture of a Gibson guitar!! Later that night, it was revealed that the strings of the Gibson guitar are NEON. OooO. In case you didn’t believe it was an ice guitar. Ah, the art of a spilled glass of wine? An experimental orchestra, comprised of 50 guitarists and bassists from around Seattle. Visit our REAL website in the near future for an actual write-up of the music portion!! It was SICK. In a good way. Are these cake girls a trip or WHAT? We tried following them and their little parade… to the magical land of cakes… but the cake land never showed itself :[ No joke… they had boxes of cake but they wouldn’t tell us how we could eat it. So cruel. On the way to the land of cake…? 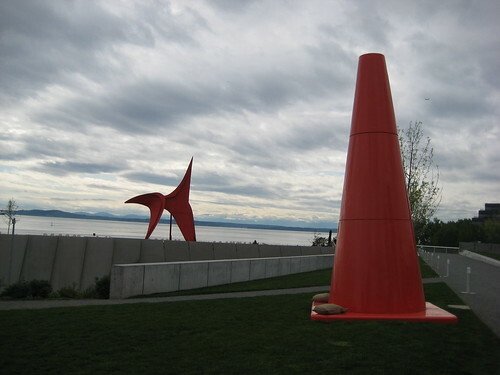 Oh we have many more adventures of this past weekend at the Olympic Sculpture Park to come soon, but for now, enjoy the pics of the new installation!!! 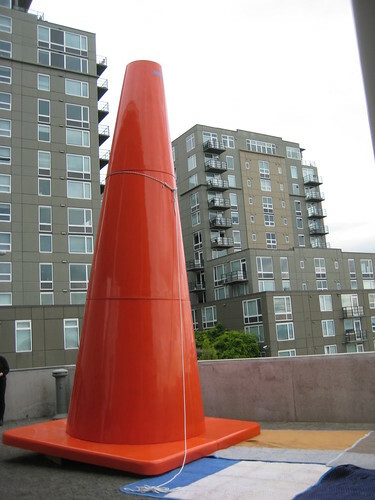 Glaze and pigmented cast fiberglass “Safety Cones” by Dennis Oppenheim! 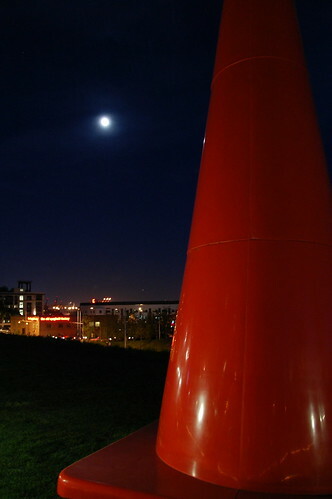 They will be on show at the Olympic Sculpture Park from May through October 2008. This cone *JUST* got set up. Damn! Barely missed it. Victimless Jacket at MoMA… ew? Uhhhh. This jacket, shown at the MoMA, was made of stem cells from mice and was fed nutrients. It died after five days due to some complication (they had to pull the plug). Yes, it is alive. Or I guess I should say WAS. Since it’s dead. More details here. Pretty much the most amazing thing you will ever see, by Blu. Blu did the animation and editing, with the assistance of Sibe. Music by Andrea Martignoni. Produced by Mercurio Film. Done in Buenos Aires. 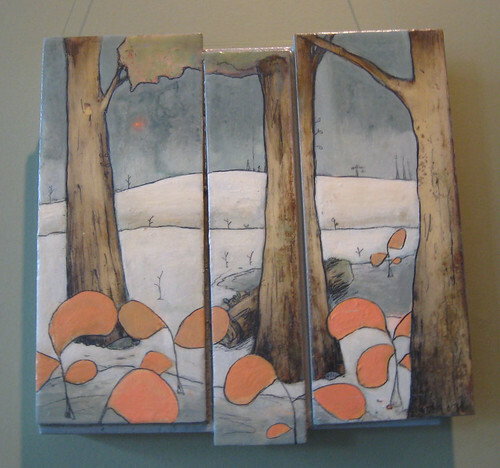 Bunches and bunches of art from the Greenwood/Phinney Art Walk yesterday! Enjoy! “This painting is a somewhat whimsical commentary of the pomp of organized religion (not to be confused with spirituality), the futile quest it encourages (for vitality already found within), and the candy-coating of its savagery that would otherwise expose its hypocrisy. Fabric “vessels” by Cameron Anne Mason. These are simply beautiful and involve hours of work. 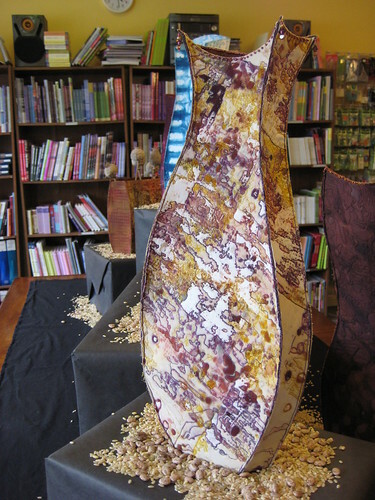 The process involved designing the pattern of each piece, hand-dying the fabric, sewing it, and quilting it. 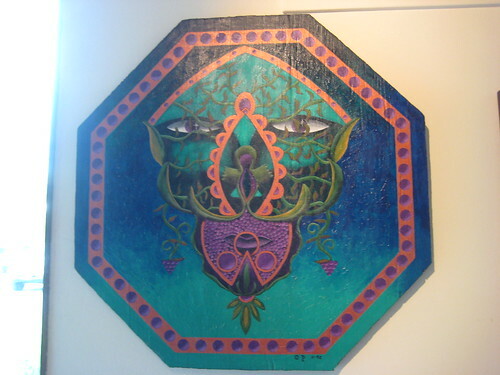 A brightly-colored piece by Paisley O’Farrell. Due to glare, this is not the best photograph, but this is a piece by Mimi Williams, an artist from Olympia. 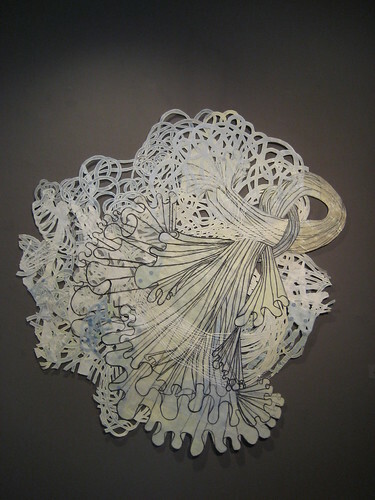 She does linoleum prints on various pieces of paper and then collages them into one cohesive product. 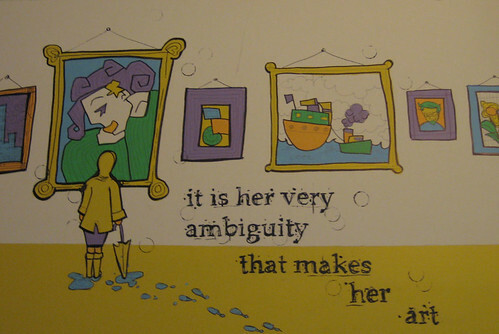 All of the colors in her image come from colored papers, and all the inks are black. 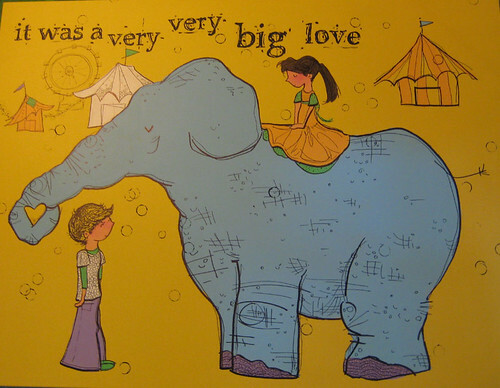 Cute acrylic pieces by Megan Marie Myers that could be perfect for children’s books. 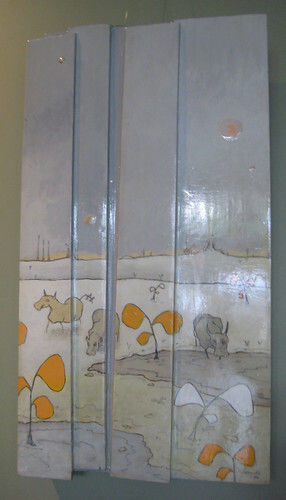 Beautiful painted panels by Jim Stoccardo, on display at Herkimer Coffee. “De-Mask” series by Kathy Liao. 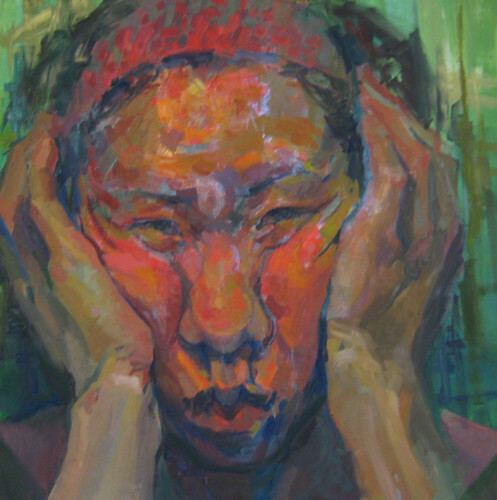 This is a huge self-portrait, which studies the different “masks” she wears in life. 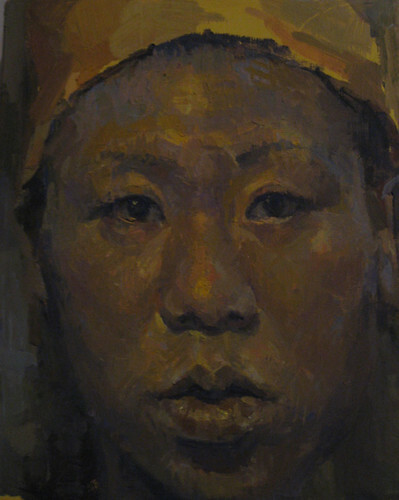 Same as above, although this one explores – in particular – a stereotype by her Asian grandmother that pale is beautiful. 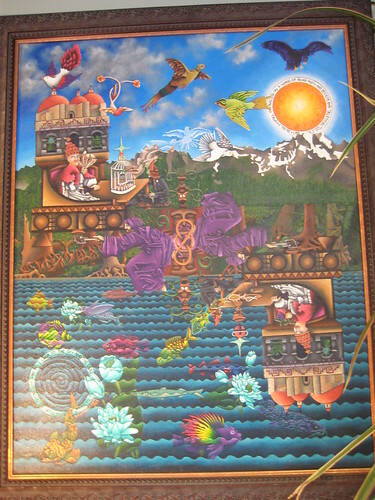 A cool mural by P. Darrington (details, anyone?) in Greenwood/Phinney. Beautiful. 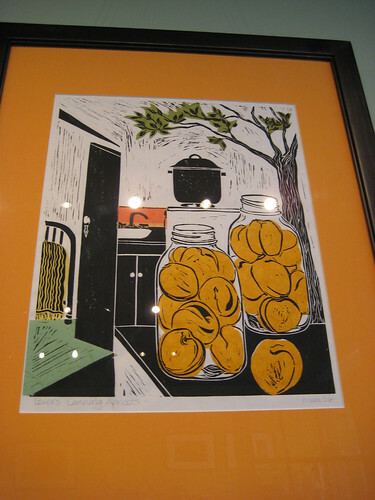 I’ve been by the Francine Seders Gallery a million times but it has never been open. Today, for the first time, it was, as a part of the annual Greenwood-Phinney Art Walk! Yay. The first image I saw at the gallery, and already, we’re off to a good start. 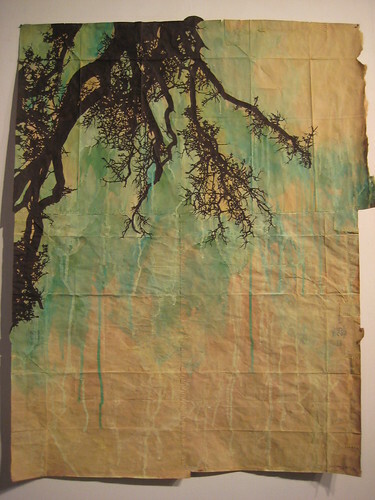 This new body of work by Maysey Craddock features silhouettes of gouache trees, painted on paper bags sewn together with silk thread. Trees are certainly not a new theme but this is beautiful. Same as above, but it’s much more obvious in this one that the canvas is nothing but a paper bag. 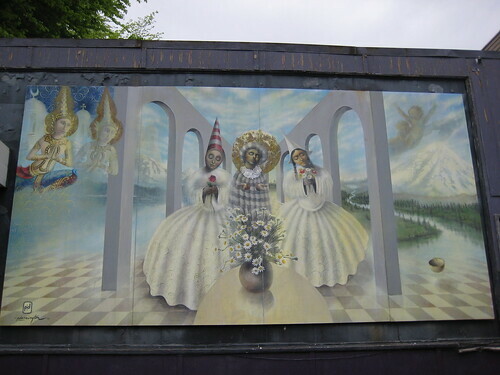 Look forward to seeing more by Craddock, a painter and sculptor from Memphis (who is currently living and working in Munich). 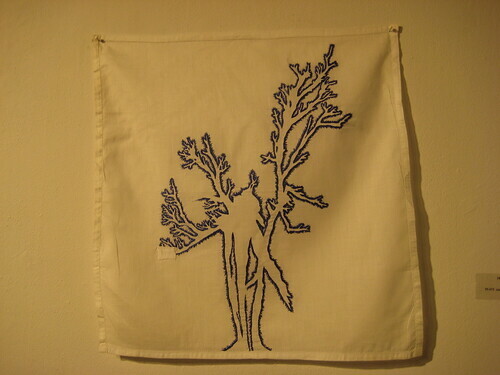 “The Memory of a Tree” – A slight departure from the above pieces, this piece was embroidered on a found textile piece. $2,000. 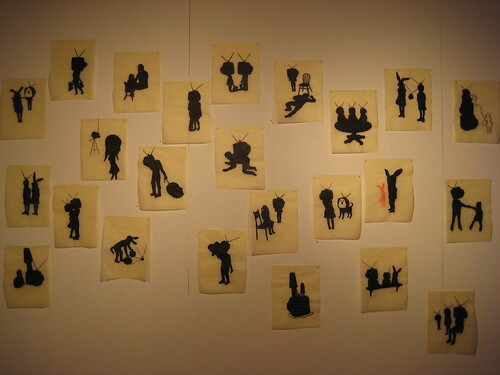 Silhouetted figures in various positions. Ink on semi-transparent paper. 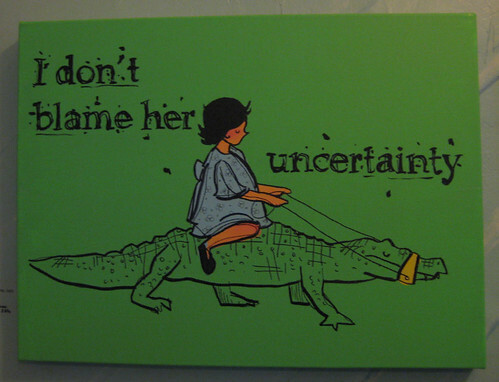 By Pat DeCaro. Mixed media collage by Gail Grinnell. 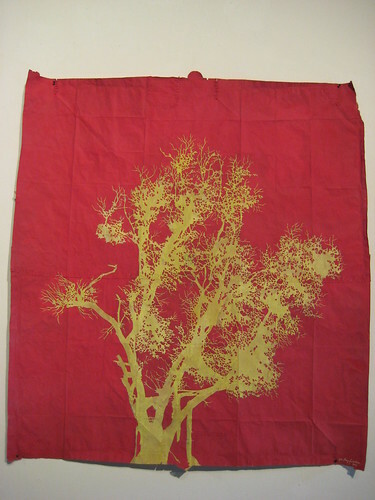 Acrylic on polyester, silk, and paper. More to come from the Greenwood/Phinney Art Walk.